Two thousand killed or 150? Controversy surrounds the death toll in the northern Nigerian town of Baga and nearby villages following an attack in early January by the Islamist militant group Boko Haram. Differences in methodology and filtering lead to wide differences in estimates. 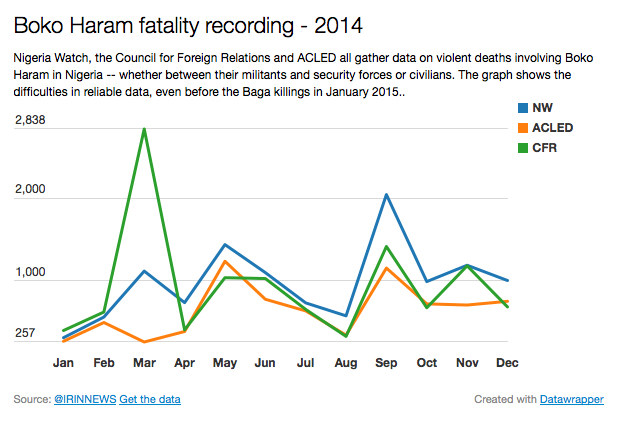 IRIN compared the total reported Boko Haram-related deaths in 2014 from three tracking services. The figures include deaths among security services and militants as well as civilians in incidents only inside Nigeria. IRIN found ACLED’s estimates to be the lowest (at 7,711) compared to two others, the Council on Foreign Relations (11,245) and Nigeria Watch (11,779). In March 2014, there is a difference of over 2,000 between the highest and lowest estimates. While ACLED had hesitated in the past to cite casualty figures, which are seized on by the media “rather than the rich detail in the data”, the raw numbers do provide a means to gauge trends and intensity. According to Raleigh, her preference is to use local media reports as sourcing, in the hope that will maximise ground truthing.